I first visited Israel for three weeks in the summer of 2012, as a part of a program through Wheaton College, called Wheaton in the Holy Lands. This trip turned out to likely be the best trip of my life. Not only was I able to learn about biblical sites intimately, retrace the footsteps of biblical figures, gaze upon beautiful landscapes enjoyed by those same figures, but I also met my wife on this trip! She and I have been reminiscing about this trip recently as I plan Clapham’s 2020 trip to Israel. It is difficult to narrow down the best sites to visit in Israel, let alone Jerusalem, but here are my top five. The first site to visit is a no brainer. If you had ten minutes in Jerusalem, this would have to be the one location to visit. The Church of the Holy Sepulcher is built upon the historically probable site of both the crucifixion and resurrection of Jesus Christ. It is located in the heart of the Old City, in the Christian Quarter, and if you didn’t know about it, you might even walk right by without giving it a thought. Compared to its neighbor, The Dome of the Rock Mosque, this church can look rather unassuming from certain angles. The church’s origins reach all the way back to the mother of Emperor Constantine who set out to the Holy Lands to build commemorative monuments for significant Christian sites. Throughout the centuries until about the Renaissance this church has been added to and has undergone some restoration since then. The Church of the Holy Sepulcher may not be the most ornate church from the outside, but upon stepping in, you are struck with awe at its beauty. Your nose will immediately pick up the scent of incense being used in the nearly continuous church services held daily. If you are like I was, unaccustomed to incense, every time you smell it going forward, you will be transported back to this holy place. As you silently proceed, you will hear the worship of one (or potentially more) of the various traditions who share this building. You will also notice, as a likely American Protestant, that none of these traditions are yours. This church houses six religious traditions under one roof, and they include Roman Catholic, Greek Orthodox, Armenian Apostolic, Coptic Orthodox, Syriac Orthodox, and Ethiopian Orthodox traditions. The beauty of worship is made clear as you observe ancient traditions that look vastly different from our own. 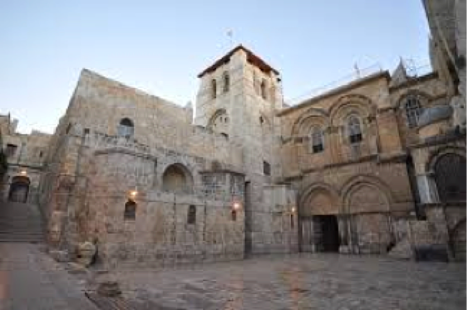 As you continue deeper into the church, you will wait in lines, walk up and down uneven steps, negotiate some crowds, and find yourself face to face with the shrines commemorating the Rock of Calvary, where Jesus was crucified, or the Tomb of Joseph of Arimathea, where Jesus was buried. Not far from the Church of the Holy Sepulcher, you will find all that the Romans left of Israel’s Second Temple. The First Temple, built by Solomon, was destroyed by the Babylonians in 586 BC, but rebuilt again in 515 BC. In 70 AD, roughly 35-40 years after the death of Jesus, the Romans, led by future emperor Titus, destroyed the temple so completely that only a retaining wall was left. This wall is now known as the Western Wall. Although it was not actually part of the temple itself, as it instead structurally held up the Temple Mount, it still serves as a symbol to a monument originally blessed by God. Today, you will find many groups of people praying at the wall, often leaving little folded notes in the seams of the wall. Although separated, men and women are invited to pray to God alongside all that is left of the temple where God’s Shekinah glory met Earth in the Holy of Holies, where fire went up to the sky as God consecrated the house of worship, and we are invited to share a moment in this place. It is not so much the site of the Mount of Olives that is inspiring, but rather the sight from it. 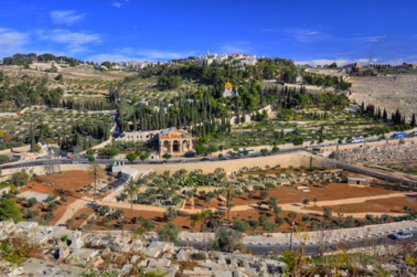 From the Mount of Olives, you can see the entire city of Jerusalem. Standing atop this hill, you can imagine Jesus walking towards the city from Bethany, a town east of the city, during the last week of his life. As Jesus summits this hill, he looked down upon all of the city, with the Second Temple prominently displayed. You can just imagine the compassion (σπλαχνα, my favorite Greek word) Jesus had for this city and its people, even while knowing how quickly they would turn on him after his triumphal entrance. As you descend from the Mount of Olives towards the old city walls, into the Kidron Valley, you will find several churches along the way. At the foot of the hill lies the Church of All Nations, a Roman Catholic church, which resides right next to the Garden of Gethsemane. 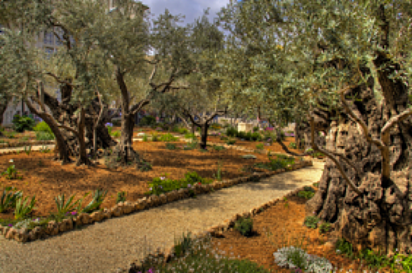 This beautiful garden, full of olives trees (which can live to be 2000 years old), is likely the very garden Jesus spent his final, earthly moments of freedom before being betrayed by Judas and seized by his fellow Jews. Here you can take a moment to pray about and contemplate the depth of human anguish Jesus felt, so much so that he cried tears of blood. Despite these emotions, he was loyal unto death for us. Trace his footsteps as he gets taken to the temple which brings us back to the Western Wall, and then to the Church of the Holy Sepulcher, at Golgotha. Also known as the Siloam Tunnel, this pitch black, unlit, knee-deep water tunnel has much more significance to the Old Testament, but still makes an appearance in the Gospels. As Jerusalem prepared for a siege by the Assyrians during the reign of Hezekiah, a tunnel was constructed to bring fresh water from the Gihon Spring to the Pool of Siloam. This tunnel was carved under a portion of Jerusalem called the City of David, and supplied many with fresh water while they were besieged by Sennacherib. If the name Pool of Siloam rings a bell, you might remember the story of the man born blind in John 9. After smearing mud, made from dirt and saliva, on the man’s face, Jesus told him to go wash in the Pool of Siloam. The man goes and does this and comes back able to see. The people were so astonished that they started questioning if this was even the same man who was previously blind. Today, you can walk through this tunnel, but you will definitely need sandals made to get wet and a headlamp. The walls of the tunnel are about two to three feet wide, and the height of the tunnel drops beneath six feet at times, so you may even have to crouch while navigating through to the other end. This tunnel is not the place to hike if you are claustrophobic. 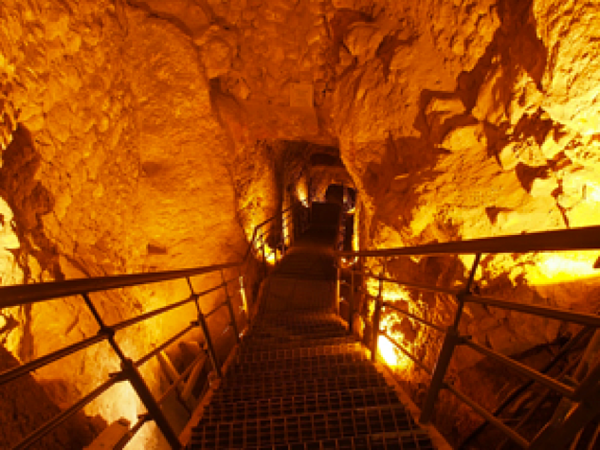 It could seem a bit gimmicky, but with proper understanding, there is no denying how cool an opportunity it is to walk through an age-old tunnel underneath Jerusalem, one that served such a vital purpose in the days of our biblical heroes. Stay tuned for more blogs in our Adventure Israel Series. The author, Brian Kelly, is Clapham's resident travel agent. He has booked and led many Clapham school trips. He is currently planning Clapham School's inaugural international trip to Israel in the Spring of 2020. 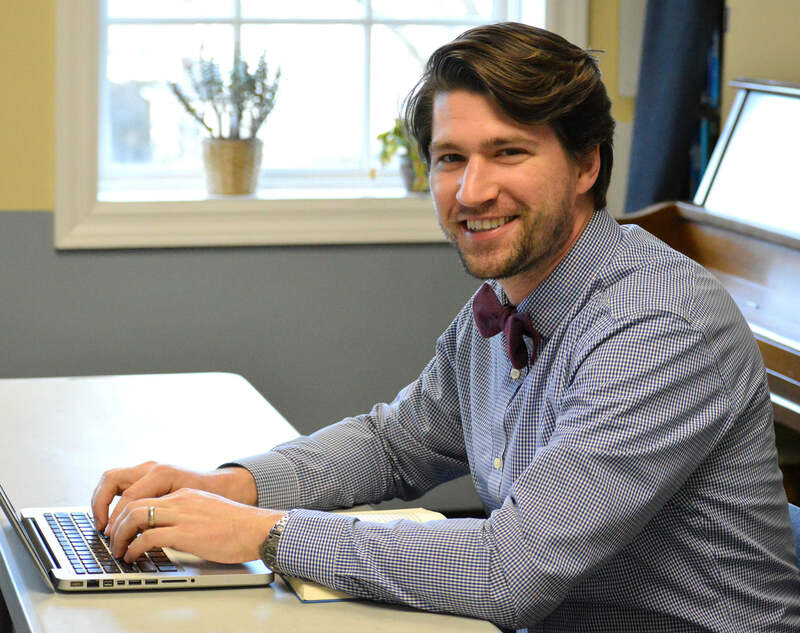 Brian studied Ancient Languages at Wheaton College, is married to Lauren, is an avid traveler himself, and is currently teaching 6th grade.